January | 2010 | 50 Westerns From The 50s. From Iwo Jima to Iraq. 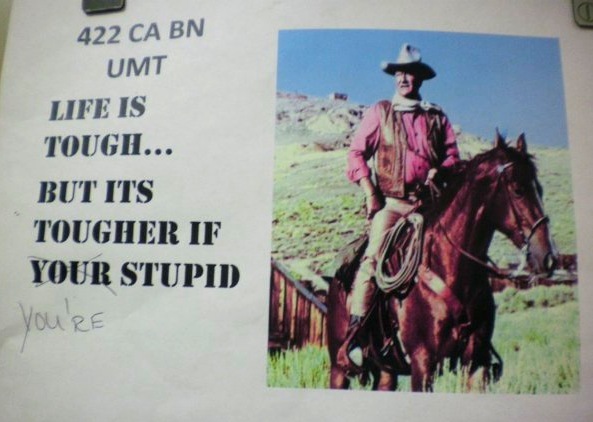 A friend just sent me this, sent to him by a chaplain friend stationed in Iraq. It’s hanging up somewhere over there (and I’ll fill in the details if I get ’em). Y’all stay safe! It’s a line from Sands Of Iwo Jima (1949). I’m sure Duke would love to see this. Working in Advertising, I see art directors and designers crop, manipulate, combine and do all sorts of stuff to photos every day, as they work to make them fit the project they’re working on — and the idea they’re trying to illustrate. Sometimes the results are truly stunning. Other times, not so much. 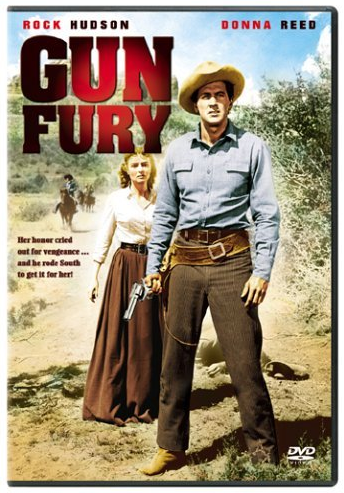 Take the DVD release of Raoul Walsh’s Gun Fury (1953), for example. 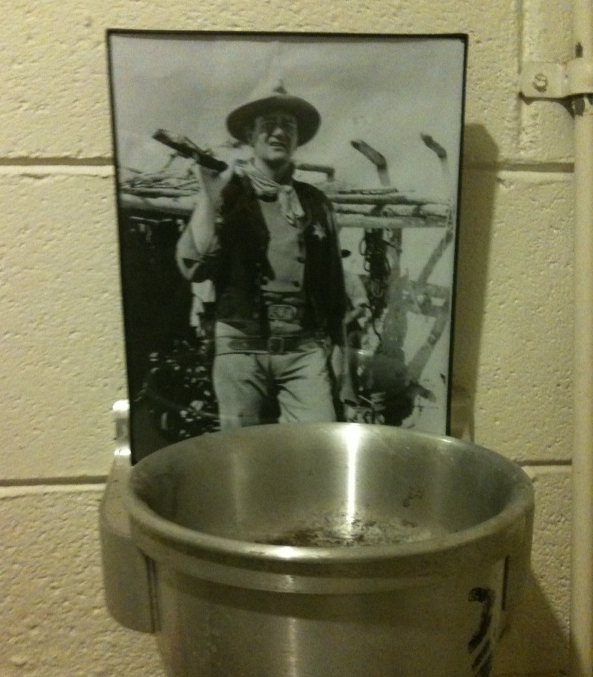 Above is an original still from the film. That’s Donna Reed and Rock Hudson. Now, look at the DVD package below. First, they moved Reed and Hudson closer together, no doubt to work better with the vertical shape of the DVD case. I’m OK with that, even though it makes her appear about three feet tall. They did a decent job coloring it, too. Next, look at Rock’s right hand. Photo, no gun. DVD, gun. They dropped someone else’s hand on the end of Rock’s sleeve. Perhaps they figured you can’t have a movie called Gun Fury and not have a gun in the hero’s hand. Now study the pistol — it’s way too modern. And if you look a little closer — Rock’s still got a pistol in his holster! Most of these old films had such beautiful posters and ads (Reynold Brown’s work is a favorite of mine), so it really gets me when Columbia or whoever decides to take a still and just throw some Photoshop at it. Good movie, by the way. Here’s a quick photo from Raleigh’s Watkins Grill. This is my favorite restaurant — for an obvious reason. Another reason is the incredible food. If you’re in town, stop by. And if you run into John T. Chance, be sure to say hello. Warner Archive has announced another promotion, this one called the War & Peace Sale. 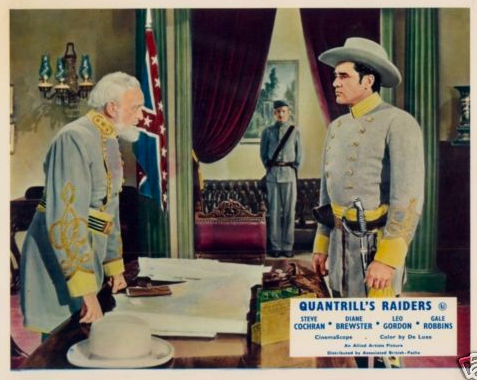 One of the featured titles, offered at 35% off, is Quantrill’s Raiders (1958). This 68-minute Allied Artists picture, in CinemaScope, stars Steve Cochran as the head of the band of Confederate raiders. It’s directed by Edward Bernds. Bernds started out as a soundman, then became a director of Columbia short subjects. He directed the later Curly-starring Three Stooges shorts (his first day as a director was trying to get the ailing Curly — he’d had a series of strokes — to hang wallpaper), then made the transition to the Shemps. Leaving Columbia for Allied Artists, he handled a number of Bowery Boys pictures — and stuff like Quantrill’s Raiders and Elvis in Tickle Me (1965). Back to Warner Archive. There’s still a couple days left for their Wild Western Sale. From a Tom Weaver interview found at The Astounding B Monster — he forgot to mention Lon Chaney! Pernell Roberts, Bonanza‘s Adam Cartwright, has passed away. Originally from Waycross, Georgia, Roberts came to Hollywood via the Marines and Broadway. 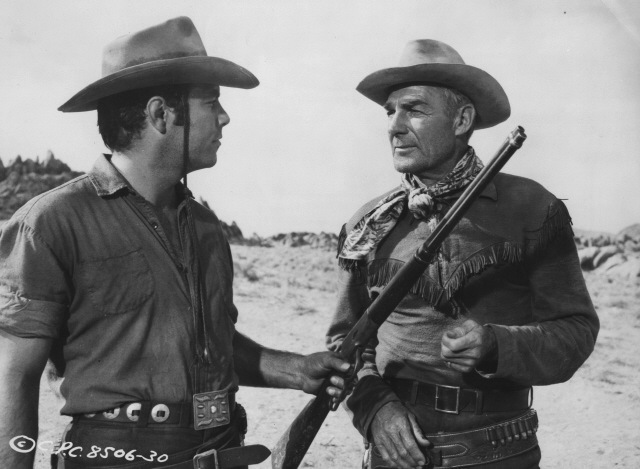 He’d appeared in an episode of Have Gun Will Travel before landing a prime part in Budd Boetticher’s incredible Ride Lonesome (1959), the next-to-last of the Boetticher-Randolph Scott pictures. (See above.) He’s excellent in it. That same year, he’d start his run as Adam Cartwright. Roberts left the Ponderosa in 1965, over a number of creative differences — the same year he participated in the Montgomery-to-Selma marches. A number of TV appearances came next, followed by Trapper John, M.D. I really hate filling this blog with news like this. Just saw at Laura’s Miscellaneous Musings that actor-dancer James Mitchell passed away at 89. He appeared in a number of musicals, dancing his way through stuff like The Band Wagon (1953) and Oklahoma (1955) — and he’s known to a lot of folks for his almost 10 years on All My Children. 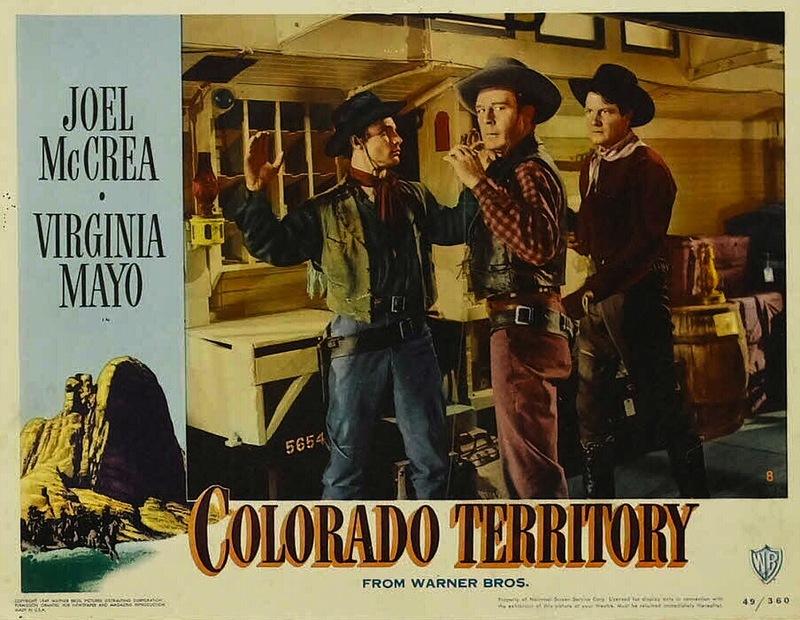 But Mr. Mitchell was also in one of my all-time favorite Westerns, Colorado Territory (1949) with Joel McCrea. (That’s him on the left.) He appeared with McCrea again the next year in Stars In My Crown. 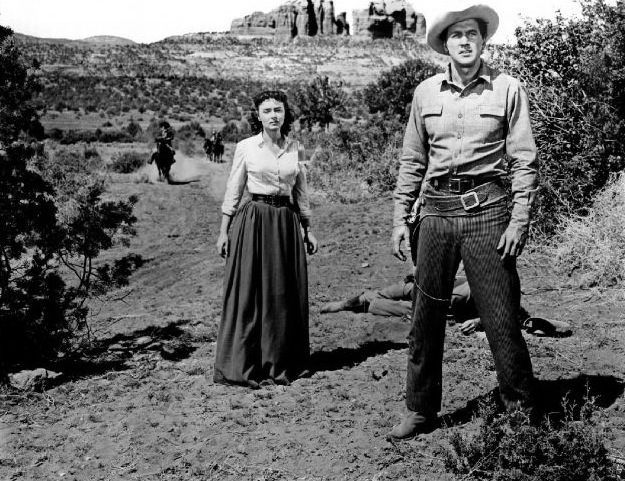 And he’s also in the incredible Anthony Mann film noir Border Incident (1949).